taganrogcity.com | Video bridge held between young artists of Taganrog and Gütersloh, Germany. 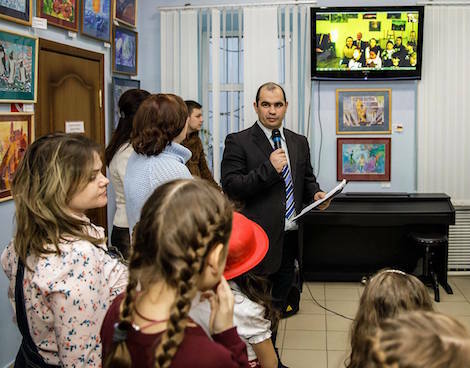 Video bridge held between young artists of Taganrog and Gütersloh, Germany. March 4, 2018: a "video bridge" communication was organized between the kids' art studio in Taganrog ("SOBITIE" led by Svetlana Sergeeva) and "ARTigeKinder studio in the city of Gütersloh, Germany (led by Svetlana Samsonova). Dmitri Kulitchev hosts the video communication with Gütersloh. © Sergey Plishenko. Among the guests on the German side were Mr. Fisher and Mr. Jantos of The Forum Russische Kultur Gütersloh, and on the Russian side — representative of The Forum Russische Kultur Gütersloh Mrs. Petrovskaya, professor Mrs. Galina Polenova and senior specialist of Taganrog Foreign Relations Office Mr. Kulitchev. Professor Galina Polenova speaks. © Sergey Plishenko. 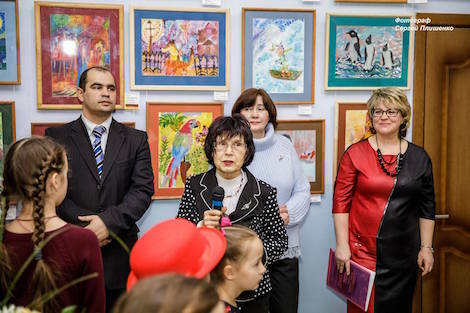 The tradition of joint children art exhibitions between the two cities started in 2010. The new edition of the show is dedicated to animals, while the previous one was entitled "Cinema Magic" and was dedicated to the world of cinema.